what REALLY MAKES ME MAD! Started this discussion. Last reply by Megan Ferguson May 8, 2012. Is it safe to handle trout? Started this discussion. Last reply by Avery Oct 28, 2009. Started this discussion. Last reply by nicholas trinh Sep 10, 2009. Avery's awsome fishing page thing. "i find mini salted tube jigs work very well especially white ones with a lead jighead." "We use either a rubber minnow or a pinky (pink lead head, white tailed streamer) either casting or trolling with an ultra light combo. Depth and speed may varry but have observed a moderate speed (not too fast or slow) and cosistant once the…"
"Where is this? Which lake?" "You need to develop thicker skin. There will always be those individuals that think they are better than others. most of the time ,something is missing in their lives.I catch and release 500 to 1000 bass a year and eat less fish than probably 90…"
"i hate people like that, but at the same time i'm not into unnecessarily harming fish. But yeah it makes me mad too!" "omg bill dance is so funny! best fisherman ever." "yeah some people are idiots"
"dude i know what you mean about trout fisherman. i fly fish for trout when i get the oppurtunity, and i love it, but i know some ppl that wont take the trout out of the water. This company is starting to make flies that hook the fish from the…"
Catfish, Perch, Sunfish, Largemouth Bass, Carp, Croaker, Sharks, Flounder, and Trout. Fishing is my life. All I think about is fishing. If there was no such thing as fishing, I dont know what I would do with my life. Me climbing a canyon. 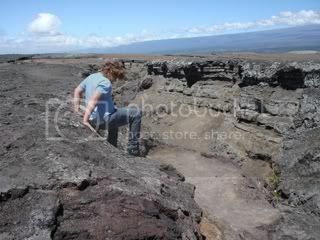 Its not really a canyon, its actually a big ditch thing in Hawaii formed by lava flow, but in the picture it looks like a huge canyon. I love the outdoors. The rainbows in the Guadelupe are pretty decent. They stock them 14-18 inches and the holdovers can get big. They look like footballs. All the guides and other people I have talked to like to use tiny nymphs and emerges, sizes 18-24. I have tried using some dry flies mostly as indicators but I have never had one come up top. They sit on the bottom in the cold water and get fat. I am from Miami, fishing I miss the fishing back there. Try bottom fishing (whit a jig and a trail of crawdad in it)if u are in a boat follow tthe islands and points, close 2 the shore and undernith a concentration of trees, the trick is 2 find any type of cover, where bass can hide from the sun and the baitfish!!! Remember there are ambush fish, and they like 2 hide in heavy cover!!! Try 2 use lures with snag free(jigs, Texas rigs, Carolina rigs, etc) I hope that this tips help u find more bass!!! Good luck... Let me know if that work!!! Cool pics, I see that u are mastering the fly rod at such as young edge!!!! Keep the good work, add more pics!!! well if your going three weeks from now, look into using mahogonies, and march browns with hatches starting in late afternoon and spinner falls going into the night a bit. There are a million big, ugly streamers u can throw at log jams and get bit on during the day, try anything that mimics a sculpin or crayfish, and i hear that olive has been an awesome streamer color this year. As far as where to fish, the entire river is productive and your only limited by wether or not u have a boat. Cummins flats boat launch in Mio is an excellent area for huge numbers of mid-size trout, with some monster browns well over 20 inches eating these fish as well. If u want to try something new, try fishing the hex hatch at night, big browns cruch these giant mayflies in the middle of the night, also try dragging mouse patterns across the surface by logs at night for something cool. But as a precation i would either get a guide or wade scout the water during the day if you decide to fish at night. sick song man... Love Vanna! Check out my group, would love to have you!